At some point in our lives, many of us have either experienced back pain or known someone who has. More than 80% of Americans have reported experiencing back pain. Here's what you can do to avoid becoming part of this statistic or to minimize back problems you may have. Maintain your ideal body weight. Exercise and perform stretches to develop strong and flexible supporting muscles especially your stomach and leg muscles. Organize your work area to reduce unnecessary lifting or moving of materials or equipment. Provide adequate time for a project. Warm up prior to strenuous work. Plan a Lift - Estimate the reasonable weight of loads to be lifted by gently pushing or tilting the load before making the lift. Maintain a clean and organized work area to allow easy access, good visibility and a clear path when lifting and moving materials. Obtain equipment such as stepstools, ladders or mechanical lifting devices appropriate for you to perform your tasks. 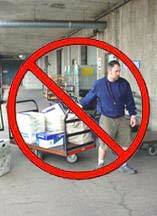 Use lifting aids whenever possible such as hand trucks, dollies, carts or forklifts. Breakdown heavy, larger loads into smaller, lighter ones whenever possible. Obtain assistance when the task is more than you can handle alone. Do not twist your torso when lifting objects. Move your feet in the direction you're traveling. Keep the object to be lifted or carried close to your body. Keep objects at knuckle height whenever possible. 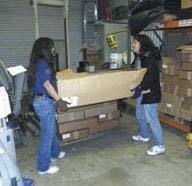 It is easiest to lift objects placed between knee and shoulder height. Store heavy objects below shoulder height to reduce lifting demands. Lifting above shoulder height is stressful on your back and shoulders. Avoid lifts above shoulder height as much as possible by locating frequently used materials at or below shoulder height or use a step stool to position yourself closer to objects stored above shoulder height. Take frequent alternative work breaks. Vary job duties as much as possible throughout the day. Perform stretching exercises throughout the day. Whenever possible, slide the object closer to you before lifting. Support your body against an object such as a table, the fender of a vehicle, shelving or a cabinet. 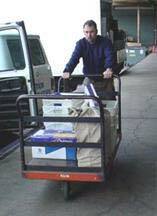 Use a step stool or ladder to get close to the load. Slide the load to the edge, down to your body and waist level. Reposition your grip and carry to the destination. Do the work with your arms and legs. Pull the load close to you. Raise the load onto your knee for support. Lift the load with your legs. Breaking down the load into smaller, lighter ones. A two-person lift – When performing a 2 person lift, the lifters should be approximately the same height, and coordinate the lift – on the count of 3, lift. It is easier to push an object than to pull it. When pushing objects: Avoid locking your elbows, lean into the object you are pushing, keeping your back straight and using your legs and the weight of your body to move the object. OSH Back Injury Prevention training class.